Reporting & Analysis lets you record the detailed activity of your system and generate reports based on the data collected. Reporting is a critical part of any enterprise system. Reporting & Analysis provides an intuitive user interface and the ability to create custom reports on the fly. It captures all logins, searches and downloads. The reports can be exported as a native Excel (.xlsx) or CSV files so they can be shared with and analyzed in external applications. Administrators can control which users can create and view reports, and the data they can use in their queries. This is helpful when used across departments or in an “agency model” when managing assets for multiple clients. 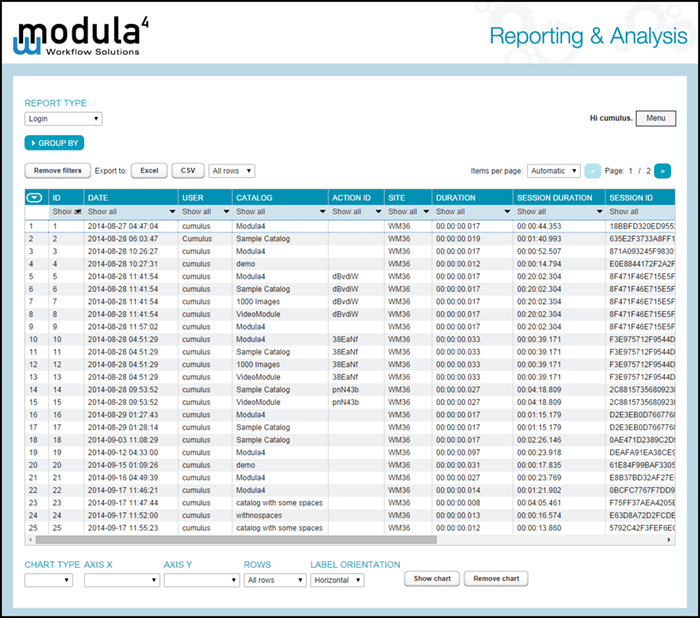 Reporting & Analysis is included with the DAM4 Platform, and as an add-on to Web Module when purchased separately. To learn more about Reporting & Analysis, contact us. After we implemented Modula4’s S3 Connector, the download times were vastly reduced for all of our worldwide locations.